Not sure if this is entirely along the same lines but I’ve struggled with schools notions and attempts to be all things to all kids. That mantra is fairly prevalent. The idea that every school, every teacher has the capacity to reach every kid can be a pretty arduous task and often creates undo blame and guilt. If we indeed focus on less, focus on what we can do and do well, I think we’ll be better off. The trade off will be that some times we’re going to have to admit when our buildings and spaces aren’t suited for everyone and that’s going to have to be okay. That’s not about abandoning children but being responsible to help them find the space and community that works for them. In some ways that would mean having spaces that are more unique, more specialized in the same way people are unique. I think that’s a difficult concept for schools to embrace as they’ve been told “all children can learn” which, while I believe is true, I also don’t believe all children can learn everywhere. This would be a great conversation to have with schools. Yes, I think this is a good fit for the discussion. It opens up the good conversation around all schools as comprehensive schools and what we sometimes refer to in West Vancouver is each school with its own signature – that might be appealing to a certain type of learner more than others. And then, of course, one is into the debate over the power of neighbourhood schools. 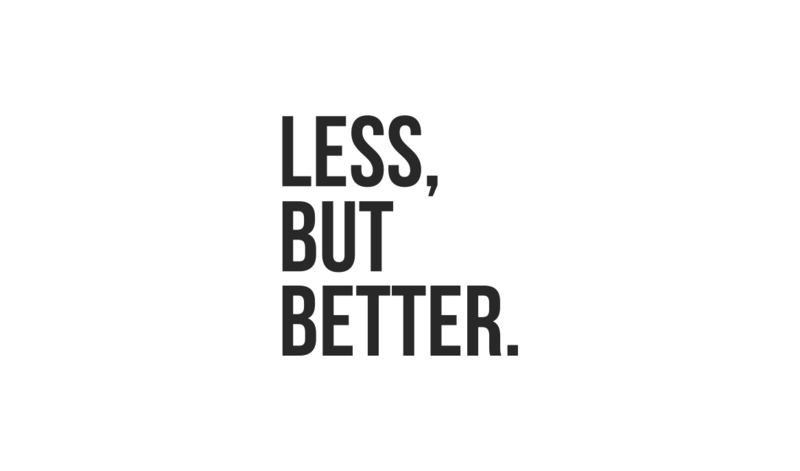 To move slightly off this topic, for me the notion of “less but better” makes me think of how we got in this place where schools are not only responsible for literacy and numeracy, but the arts, physical activity, and in some places still even driver education. While it just seems natural that sports are a part of school in North America – people in some European countries think this is odd – perhaps an example of since schools were really good at teaching Math and Science they should teach sports as well. And thus, perhaps a lack of clarity in the purpose of schooling. Even with all the discussion around finding “white space” in the school day and the move to fewer outcomes, it is almost weekly that I hear someone with an idea of something that should be added in schools. Since schools have been so good at A, B and C – let’s add more – from mountain safety, to table etiquette to mandatory guitar. Of course, they are all great – but they diffuse the original purpose and we end up with school being a collection of a lot of not well connected stuff. Couldn’t agree more, Chris. Thanks again for a most interesting post. Thanks Malcolm. It is a notion we will have to pick up on when you work with our Board later this spring. This is a terrific post. My book ‘Do Less Better. The Power of Strategic Sacrifice in a Complex World’ makes these points as they apply to business. I’m delighted to see an educational leader expounding the benefits within the academic world. The interesting irony? Doing less better in no way implies doing less work. Those who embrace focus, work harder because they are passionate and emotionally-connected to the vision. Thanks John for the comment and the connection. I actually see doing less better can be more work – as the increased focus leads to an increased depth and accountability. Without question, the teachers I see having kids go deeper with inquiry are not creating less work for themselves or their students but different work. * Remember Stephen Covey: less is more? * You may enjoy reading “The Organized Mind” by Levine. The first 2 chapters ‘connect’ with the idea that less is best and goes on to deal with ‘what is essential’ and organizing with the criteria of ‘essential’ as the guide. John, your comment on ‘focus’ indicates you would enjoy at least the first 2 chapters of this book. * John, so true! Doing less better is challenging cognitive work. Deep learning is only possible when we focus on doing less better because deep learning takes time, so much more time than memorizing ‘everything’. * Cognitive overload is a much talked about issue in cognitive neuroscience. And John Hattie with Gregory Yates has much to say about the problems cognitive overload creates in our lives. It is quite shocking to see the science regarding just how much kids, youth and adults can handle in the conscious brain at one time and then consider what we expect kids (and ourselves) to manage. * Dean, the ‘elephant in the school room’, in my opinion, is the impossible idea that teachers (and schools) can be all things to the limitless diversity of all students. Talk about overload! There are some cognitive neuroscientists (e.g. Charles Ahearn and deKirby) who are saying that at the subconscious level of our brains (where much more happens than at the conscious level) we are more alike than different when it comes to learning. And when we look at human relationships there are some common needs regarding relationships that we all share. We could re-think what we are trying to do using neuroscience to help us make some decisions. Thank you Chris for the link to the new BC curriculum. After I have cleared my driveway of the 2′ of snow that fell these last few days, I will come in and start looking at it.